Hurry! This Special Deal Ends December 31st! Join or renew your WITI membership today to receive over $474 in savings. Plus FREE Membership in Two Partner Organizations! For more information, please visit our website. Already an active WITI Member? Please visit the Member's Area. There is a new Article Library, more free videos from our 2004 National Conference, access to discounts and the Members Directory. Coming soon: Publication opportunities for your articles on WITI's website... Share your knowledge! In a recent issue, I dealt with how you can improve your odds against breast cancer. That applies to many other cancers as well. But what if you are a cancer survivor? Then there's another risk to know about and act upon - heart disease. Whether or not you've had cancer, you should still read this because cancer and heart disease are closely intertwined, and women are especially at risk. You, or someone you know, may need to know this information. Did you know that having cancer could predispose you to heart disease, the number one killer? I have friends who have survived both breast cancer and heart disease. At first, I thought that was a strange coincidence, but then my friend, Catherine, who is a breast cancer survivor twice over, mentioned that chemotherapy drugs affect the heart. Talk about a one-two punch! Are you ready to transform your life and/or your career? Do you need help figuring out "what next?" Do you want to explore what your life purpose is, so that you can create a "Mission Statement" for your life? Do you have a Mission Statement, but don't know where to go from here? If you answered YES to any of these questions, please join us for a WITITalk Teleclass. Participants in these teleclasses have made major changes in their lives, after just the first class! "When I go to work, it's as if I leave my true self locked in the car. I go up in the elevator and emerge as Work Self. If I leave in time, I can get back to the car and reclaim my true self. But if I'm too late, by the time I get there, my true self is just out cold." That's how a salesman I hired described his life in corporate America. He had to be two different people. Work didn't want his true self, but he fought hard to keep it alive. Sometimes he succeeded, sometimes he didn't. Sound familiar? Of all the issues I've discussed with managers and employees around the world, the most painful and persistent is the acute conflict they sense between who they feel themselves to be on the inside and who they present on the outside. My salesman -- let's call him Steve -- wouldn't find life so painful if his two selves were closely related to each other. But they aren't. They are dangerously very far apart. At work, he advocates independence, fast results, toughness, and flexibility. At home, he preaches the importance of loyalty, long-term commitment, selflessness, and steadfastness. No wonder he's hurting. Dawn Sweetser has recently joined New England Cryogenic Center (NECC), the parent company of the New England Cord Blood Bank, as their Director of Marketing. She brings her extensive knowledge of marketing as well as stem cell research / banking to her new position with NECC, where she leads a team in furthering the awareness and development of umbilical cord blood banking. "I am thrilled to have joined NECC. It's an opportunity of a lifetime knowing that you are part of something so significant. I look forward to educating the public on the outstanding work we do at NECC and the opportunities that lie ahead for stem cell and cord blood research", says Sweetser. Sweetser has over 10 years experience in marketing, having served as Senior Brand Manager for Holland Mark, a Boston-based advertising firm representing TJX Companies and Mass Mutual, Bank Boston, iMarket Inc., and Scudder Kemper among others. She will bring her experience with strategic planning, media relations, creative development and multi-tier management to her new position with NECC. Cord blood stem cells are currently used in the treatment of certain cancers such as leukemia as well as immune and genetic disorders. Current research is demonstrating that cord blood stem cells may someday change the way many disease are treated. NECC is a pioneer in the stem cell industry, having introduced the potential for treatment of stroke, diabetes, heart disease, muscular and cartilage diseases, autoimmune disorders and neurological disorders. 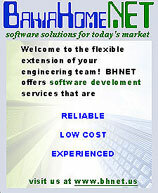 Based in Southern California, BahiaHomeNET, inc. is a USA operated software development corporation with a unique and driven approach to software development. Our business model allows us to provide customers with superior software development services at amazingly low costs. The BahiaHomeNET difference stems from our onshore/offshore partnership model and our vision of becoming the premier software solutions provider offering the most efficient, effective, and personalized service available. Our trained and experienced U.S. team work closely with customer to: understand project initiatives, lead the entire process by remaining an integral part of it, conduct high level design, and secure end product development. The BahiaHomeNET team has extensive experience in software development, backed by decades of practice. This includes knowledge of numerous languages, including C++, C# and .NET, as well as strong familiarity with modern software development technologies, such as Object Oriented Analysis and Design. Our main area of strength consists of software development in Microsoft Windows Operating Systems. Our focus includes software for real-time applications and automation. Key areas of specialty are working with semi-conductor machines, internet applications, and B2B solutions. Over 500 Sessions and 250 Exhibiting Partners! See keynote presenters Larry Ellison from Oracle Corporation; Carly Fiorina from HP; Michael Dell from Dell Inc; Richard Wirt and William Swope from Intel Corporation; Scott McNealy from Sun Microsystems; and Joe Tucci from EMC Corporation. Register Today For FREE! Linuxworld Conference & Expo is the world's leading and most comprehensive event focusing on Linux and Open Source solutions. And it's coming to Boston February 14 - 17, 2005! Come hear directly from industry leaders how companies across the globe have achieved higher profits and increased their productivity by utilizing Linux - the fastest-growing operating system in the world. For more information please visit www.linuxworldexpo.com. WITI Members: Visit the Members' Area for discount information. If you would like to make a nomination for the 2005 WITI Hall of Fame, please download the 2005 nomination form. The nomination deadline is February 1, 2005. It's a brand new era in telecommunications. The unique and complimentary strengths of Bell Atlantic and GTE have come together to form one of the world's premier communications companies - Verizon Communications - offering a single source solution for residential, business and government customers. Verizon offers a flexible benefits plan that you can tailor to fit your needs including a variety of options for medical, dental, life insurance and reimbursement accounts. We also have a number of work/life benefits such as an Employee Assistance Program, Dependant Life Insurance, Adoption Benefits and in some locations Day Care Assistance. We have a generous time off plan including vacation, personal days, and floating holidays. We also offer retirement benefits, including a 401(k) with employer matching contributions, and a defined benefit pension plan. You can enhance your career development through formal education by utilizing our generous tuition assistance program. Employees are encouraged to expand their professional qualifications by attending training classes, seminars, and conferences. We also have an extensive internal training curriculum designed for individual development and professional growth. Search for Verizon jobs on WITI4Hire. Systems Architect - Keane, Inc.
As a Systems Architect at Keane, you'll be responsible for the well-being of every solution your team delivers, and for the satisfaction of your clients. There are technical responsibilities: maintaining system interfaces, designing for scalability and modularity, supporting platform-level architecture and future development. There also are business responsibilities. You'll be charged with proposing and analyzing new product and platform concepts that have the opportunity to create new business. Best of all, you'll be part of a creative, entrepreneurial team seeking to make these ideas come alive.